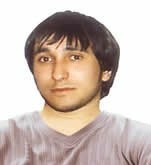 Aziev Lyoma Vakhaevich , 1983. kidnapped in November, 22, 2006. In November, 22, 2006, on the territory of republic of northern osetiya-alaniya,two natives of Chechen republic(Aziev Lyoma Vakhaevich and Magomadov Abu-Bakar Supyanovich) missed. Since the second russian-chechen war,Aziev Lyoma with his family lived on the territory entertainment «Kristall» in Nazran,Ingushetiya. In November, 22, Aziev and Magomadov went to Vladikavkaz,Northern Osetiya to buy DVD disks. They had mobile phones and 3000 rubles. At that day,at 13:56,Magomadov phoned his mother with his mobile phone. After 14:00,neither Aziev nor Magomadov answered relatives’ calls. The relatives of the missing men,alarmed with long absence of Aziev and Magomadov,started independent searches but having no results.The only thing the relatives could get to know was that the last men who noticed the young men were employees of market centre «Globus».They identified Aziev Lyoma and Magomadov Abu-Bakar by their photos. Salesmen of market centre «Globus» insisted that Aziev Lyoma and Magomadov Abu-Bakar did shopping in their store. After that,they went to the neighboring store «Asmodzal». Description of Aziev Lyoma Vakhaevich: 23 years old, height-165 cm.,swarthy,stocky.He was dressed in brown velveteen jacket with leather onlays. Black jeans,black sporting leather shoes and a sporting knitted cap.